Support your Wichita State Shockers in this Gold Short Sleeve Fashion Tee! 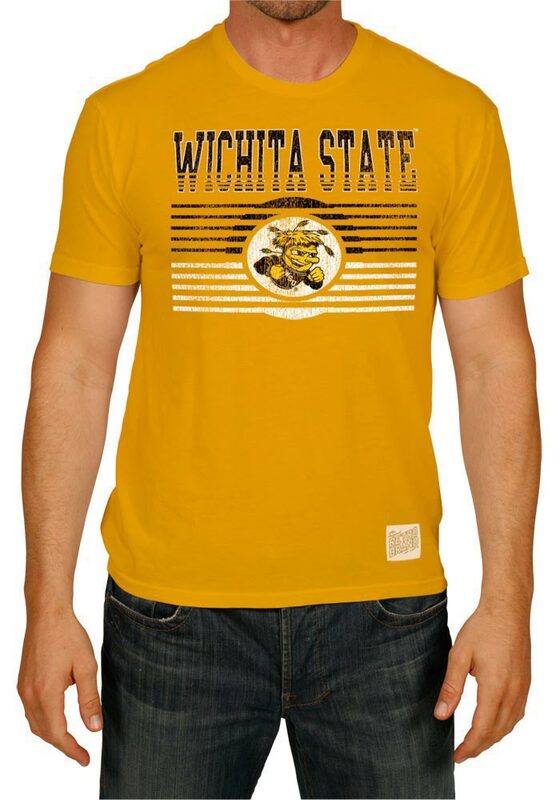 This Lines Fashion T Shirt features a screen printed WuShock mascot with the wordmark "Wichita State". Be ready to shout "Shock 'Em" when you wear this WSU Short Sleeve Fashion T Shirt in the stadium or on the street. Very happy with my selection. Rally House had a ton of BU product and I love that they have the old Bear logo. Their staff was very friendly. I've seen some other guys with that patch on their tee and I thought that was cool. Original Retro Brand makes a comfortable tee! Go Bears! I sent this to my brother in Philly and he went nuts. Every time I see him, he's wearing this tee. He says its the most comfortable tee he's ever got. He's a bigger guy (too many cheesesteaks) but he says the tee still fits him great. A must-have for any fans of KU and Stranger Things! Got one for myself and as a gift. If you go back and forth between sizes, I would get the bigger size, as it runs a tad small. Comfortable to wear.